If you were to re-write history and go back into the 2015 draft class, would you do things differently? Well, of course, looking back now Todd Gurley would’ve been the number one pick but Jamies Winston’s name was called. The Tennessee Titans were next on the clock and were in a desperate panic to draft a quarterback and that’s what they did. Marcus Mariota was drafted second overall in the 2015 draft by the Titans. Coming off a superior Heisman trophy winning campaign from Oregon, he was on the verge of being the man. Looking back now, would you keep Jake Locker for another year and ride it out for the hopes of either Carson Wentz or Jared Goff. Yes. Absolutely. No questions asked. Even if you would’ve asked me back then, I still would’ve told you yes. Regardless of the past, nothing can be done to change it now. Since entering the league in 2015 to present, Mariota has struggled to put up exceptional numbers and quite frankly to even stay healthy. In Mariota’s 56 games, he has a record of 27-28, which isn’t terrible but it’s definitely not where the Titans organization wants him to be at. 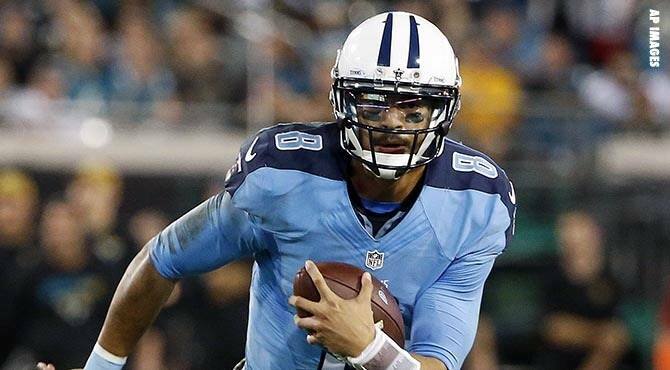 Mariota has a 63.2 percentage completion ratio with a little over 12,000 yards. He has 69 touchdowns and 42 interceptions which is another good stat when balancing the pros and cons. To be honest, take all that with a grain of salt. Since entering the league five years ago, Mariota has had a new offensive coordinator every year. As fans, we usually don’t see that from the outside looking in. We always want to immediately put the blame on the player for the team’s performance. Imagine having to be apart of a team or company that has changed your boss/mentor every year and having to learn a completely different scheme then what you have been doing. That’s touchy for an individual. Am I giving Marcus a complete out? No, but we as fans of team needs to realize not much can be done with our “franchise quarterback” when the staff can’t be consistent itself. Do I think Marcus is the future for the franchise? No, I don’t believe so. He has the heart and toughness any fan could want any a quarterback. He just doesn’t have the longevity to stay healthy to be considered a franchise quarterback. Now if I were the Titans front office staff, which I’m thankfully not, I would highly consider taking another quarterback out of this 2019 draft. First round is not so much the focus on a key position you need to be filled, but I would start to consider for the second round. That’s my two cents but what do I know. I had the Kansas City Chiefs finishing in last in the AFC South and boy was I completely wrong. Time will only tell what the Tennessee Titans will do and as fans have already felt for the longest time, here’s to another 10 years of being a subpar team. Preston covers the Tennessee Titans and the AFC South for NGSC Sports. He also covers Nashville Predators hockey. KC is NOT in the AFC South. Just FYI…let’s fx that ASAP. And yes, MM8 can be the franchise QB if the FO finally gives him some assistance.